Publication of a term paper focusing on the role of the Chorus in Shakespeare’s „Henry V“ originally written for Harvard University Extension School (grade „A-„, language: English). Here is the link. Publication of a term paper focusing on Christianity and Judaism in Shakespeare’s „Merchant of Venice“ originally written for Harvard University Extension School (grade „B+“, language: English). Here is the link. Publication of an essay on ethnic theater in the United States (grade „A“, language: English). Here is the link. Publication of a term paper in media studies focusing on the anti-Semitic depictions in National socialist movies (grade „B“, language: German). Here is the link. Publication of a philosophy term paper focusing on the impact of Neoplatonism on Christianity. The paper received an „A“ and is written in German. Here is the link. Andrea and Wyman are among the founding members of the art association „Künstler Gut Loitz e.V.“, founded in July of 2013. Chairman is art professor and artist Barbara Camilla Tucholski. Andrea and Wyman are part of its first art project (title: „Menschen, Tiere und Kanonen“) which will combine art, art history and the work of local non-profit associations. The exhibition will open in September of 2014 and will run through November in Rostock, East Germany. The catalogue publication will feature articles written by Andrea (as an art historian) and Wyman (as an artist, art theorist, and a cultural go-between). Wyman and I expect our baby boy Glenn Jolson at the end of September. His middle name is a reference to Al Jolson, the man who brought Wyman and me together. We have had some pregnancy issues over the past months, and we hope that Glenn Jolson will not make a too early appearance. 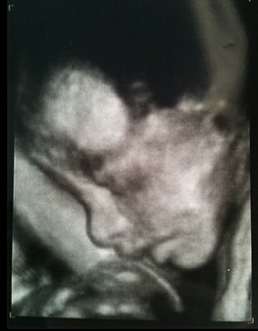 His due date is September 29th, 2013.